Singapore Armed Forces (SAF) is used as the overall description of the three branches of the military units (land, air, sea) and the land forces (the Army) specifically as well. I recently went to Singapore (...) where I obtained a booklet which had on one page all the flags of the Singapore Armed Forces (SAF). The Army Flag has a red canton of crescent and stars but the background is yellow with a seal in the fly. The seal looks similar but not the same as the seal of the SAF Flag. 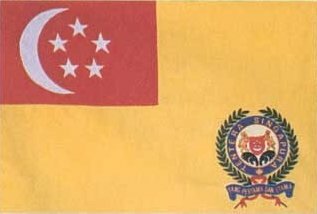 The flag described by Tom Koh is the organisational flag of the Army. It is displayed at the Army camps. I visited the Singapore Armed Forces Training Institute (SAFTI) today for the annual Army Open House and would like to report that the yellow Singapore Army Service Flag flown all over the camp, now shows the crest of the Singapore Armed Forces (SAF), equivalent to that on the SAF Flag, and no longer the one as depicted above. It was easily recognisable as all the three Services Flags (huge ones) were flown side by side with the SAF Flag. However, from an inquiry with Senior Warrant Officer Richard Ee, a Regimental Sergeant Major at the Ministry of Defence, a month back, the former crest is still official and is also known and referred to as the SAF Crest. This 'old' version would be phased out gradually and all new Army Service Flags would henceforth use the 'new' SAF Crest. The 'old' version is still used and remains unchanged on the Regimental Colours such as those which appear on the Infantry Regiments Colours. This flag is the State Colour of the Army, which is only displayed at Ceremonial Events such as on National Day Parade held on 9th August, on visits by Heads of Governments or States or at the President's inspection. It is based on the National Flag with the Army badge on the lower fly.